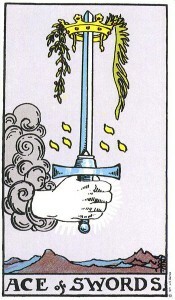 The Ace of Swords shows a hand, cloaked in white, holding an upright sword, symbolic of the mind and the intellect. At the tip of the sword is a wreath, indicating success and victory, and a crown, indicating mental clarity. However, the barren, mountainous landscape below the sword reflects challenges coming from the often cold nature of intellect. 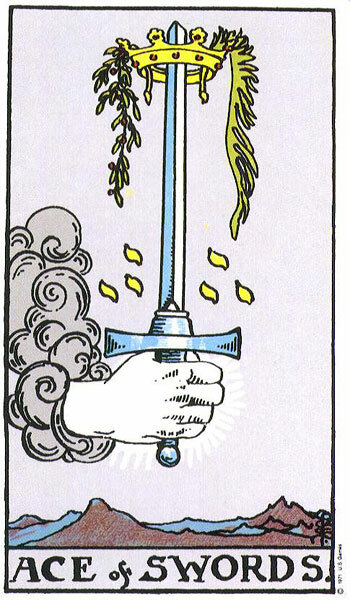 The Ace of Swords shows the beginning of a situation whose potential is as double-edged as the blade of the sword itself. The Ace implies the use of great power, even excessive power at times. No matter what the goal, there is always great power behind the attempts to reach it and, as such, very little can stand in the way of the energy of the Ace of Swords without being destroyed. The Ace of Swords represents a period of great mental clarity. It signifies a ‘break-through’ or an ‘aha’ moment where suddenly conscious understanding. Since, mental reasoning reach their peak, and achievement of goals suddenly becomes a lot easier. This is also a good time to take action. The Ace of Swords highlights a new idea, objective point of view, original thinking and creative vision. It represents a point at which you have a new way of thinking and the energy to go with it. The Ace of Swords can suggest that you are ready for ‘battle’- You have great clarity on a situation and can now argue your case with the view to come out victorious. This card invites you to use mental force and to use your intellect and critical reasoning. If faced with a challenging situation, you need to be ready for ‘battle’ and be prepared to find the strength to overcome these challenges. Sharp thinking – Clear definition of goals – Determination and planning – Cutting away with the past – Objectivity.